Manufactured in France from 1949 until 0. The Lumix-F (postwar) differs from the Lumix (pre-war) by the appearance of a flash sync socket (under the LUMIERE word). 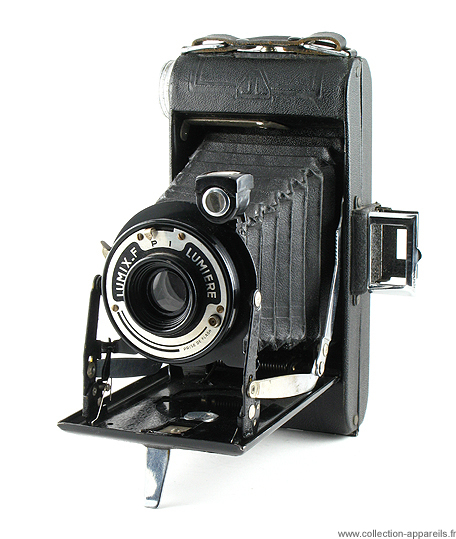 This is a basic 6 x 9 cm format camera with a meniscus lens and a single shutter speed plus bulb. The Lumix prewar had two diaphragms. In 1949, this camera is shown in the Photo-Plait catalog. In 1950, there is again a Lumix (not F) offering two speeds (1/25 and 1/75) plus bulb and two diaphragms. The Lumix has been exported to the USA. The distributor was Tetra Co.